Christopher Bell drove to the victory in Pocono on Saturday. 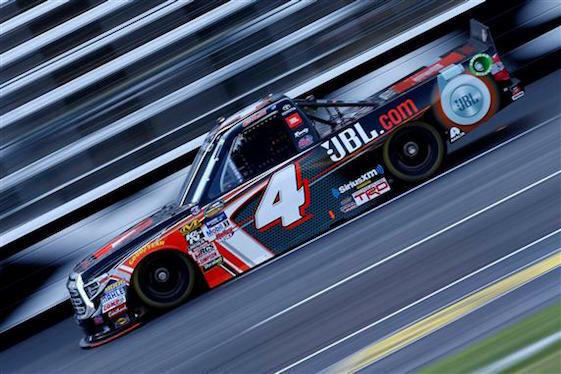 Christopher Bell pulled away to win the NASCAR Camping World Truck Series race on Saturday at Pocono Raceway. Bell overtook John Hunter Nemechek on Lap 54 of 60 at the 2.5-mile triangular track and finished 1.964 seconds ahead of runner-up Ben Rhodes, who passed Nemechek for the second position on Lap 56. One lap later Ryan Truex Jr. took the third spot from Nemechek, who held on to fourth at the finish. The victory was Bell’s first at Pocono, his fourth of the season and the sixth of his career – and it gave him the series points lead. Kyle Busch, Bell’s team owner at Kyle Busch Motorsports, won the first two 15-lap stages, but moments after the restart that began the green-flag portion of the final stage on Lap 36, Busch’s No. 51 Toyota was wiped out by contact from Justin Haley’s Chevrolet. After one more caution and the final restart on Lap 45, it took Bell nine laps to race from fifth to the lead. After battling side-by-side with Nemechek for two laps, Bell gained momentum through the Tunnel Turn and made the winning pass in Turn 3, after struggling to clear the No. 8 Chevrolet down the long frontstretch on the previous circuit. “The only real passes that I made down the front straightaway were whenever they gave it to me,” Bell said. “It was pretty tough, because I wasn’t good enough with the side-draft to stall the guy beside me and clear him by the time I got to Turn 1. I looked up in my mirror, and whenever I got side-by-side (with Nemechek) we were just bringing all those guys behind us with us. Ultimately, it was clean air that made the difference for Bell. “It was definitely who could get in front on the restarts,” said Rhodes, who spent the last three laps breaking the draft with the pursuing Truex, taking Truex’s line and blocking the No. 16 Tundra. “I was doing everything in my wheelhouse to keep him behind me,” Rhodes said. Truex was keenly aware of the second-place finisher’s tactics but said he would have done the same thing if the positions had been reversed. “Track position was extremely big,” said Truex, who posted the second-best finish of his Truck Series career, one spot short of the runner-up result he posted in last year’s season opener at Daytona. “Once we got single file, it was really hard to pass. There was a lot of blocking. Bell leaves Pocono with an 18-point lead in the standings over defending champion Johnny Sauter, who started from the rear of the field because of unapproved adjustments to his No. 21 Chevrolet and finished fifth. (3) Christopher Bell, Toyota, 60. (1) Ben Rhodes, Toyota, 60. (4) Ryan Truex, Toyota, 60. (6) John H. Nemechek, Chevrolet, 60. (7) Johnny Sauter, Chevrolet, 60. (9) Matt Crafton, Toyota, 60. (17) Austin Cindric #, Ford, 60. (13) Cody Coughlin #, Toyota, 60. (5) Chase Briscoe #, Ford, 60. (14) Justin Haley #, Chevrolet, 60. (10) Austin Hill, Ford, 60. (15) Stewart Friesen #, Chevrolet, 60. (12) Grant Enfinger #, Toyota, 60. (16) TJ Bell, Chevrolet, 60. (30) Justin Fontaine, Toyota, 60. (21) Austin Wayne Self, Chevrolet, 60. (18) Jordan Anderson, Chevrolet, 60. (28) Jennifer Jo Cobb, Chevrolet, 60. (20) Todd Peck, Chevrolet, 60. (22) Wendell Chavous #, Chevrolet, 59. (24) Norm Benning, Chevrolet, 59. (27) Bryan Dauzat, Chevrolet, 56. (11) Kaz Grala #, Chevrolet, Accident, 42. (8) Noah Gragson #, Toyota, Accident, 39. (2) Kyle Busch(i), Toyota, Accident, 36. (25) Travis Kvapil, Chevrolet, Vibration, 23. (19) Matt Mills, Chevrolet, Rear Gear, 6. (23) Camden Murphy, Chevrolet, Electrical, 4. (26) Joe Nemechek, Chevrolet, Vibration, 3. (29) Mike Senica, Chevrolet, Steering, 2. Average Speed of Race Winner: 121.594 mph. Time of Race: 01 Hrs, 14 Mins, 01 Secs. Margin of Victory: 1.964 Seconds. Caution Flags: 4 for 15 laps. Lap Leaders: 0; K. Busch(i) 1-32; J. Sauter 33-44; John H. Nemechek 45-53; C. Bell 54-60. Leaders Summary (Driver, Times Lead, Laps Led): K. Busch(i) 1 time for 32 laps; J. Sauter 1 time for 12 laps; John H. Nemechek 1 time for 9 laps; C. Bell 1 time for 7 laps.